NEWS 4/29/08 The Plaza project is on hold until the current economic issues improve. 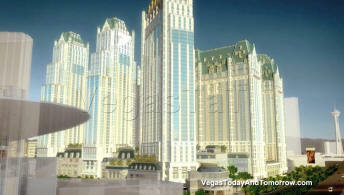 NEWS 12/16/07 Elad has put their plans for The Plaza before the Clark County planning commission for approval. The plans include: Seven towers containing 6,700 keys (4,100 hotel rooms and 2,600 resort condominium units), 175,900 square feet of casino area (making it the largest casino on the strip and second largest in the valley), 134,500 square feet of restaurant area, 347,887 square feet of retail area, 539,607 square feet of convention space, a 50,000-square foot health club, a 1,500-seat theater, and 227,038 square feet of open space on the roof top of the podium that includes gardens and pool areas. The grand total for the project includes 3,317,400 square feet of parking garages and a total area of 15,080,846 square feet. (I discuss below) has been handled (IMHO) with grace and class. This is promising to be an impressive project. Trump Towers can be seen in the upper-left and Fashion Show Mall in the lower-left. with the Las Vegas strip along the bottom. 5/15/07 ELAD, the owners of The Plaza Hotel in New York, are planning to build a $5+ billion, larger than life replica of the famed resort on the New Frontier site. 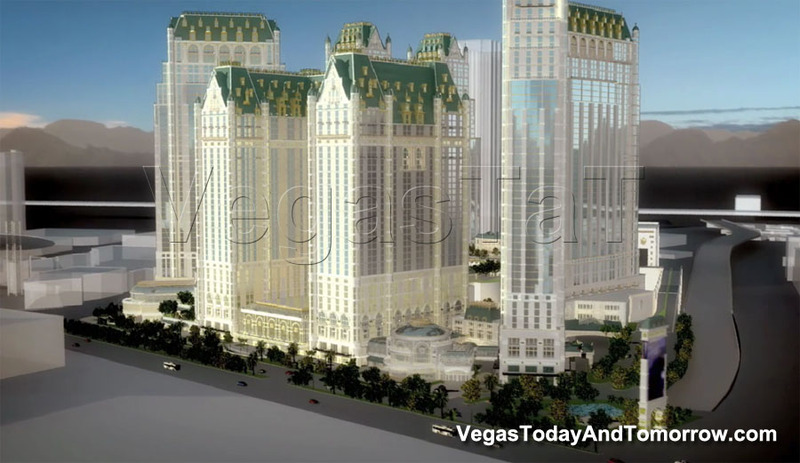 The Plaza Las Vegas (not to be confused with the one downtown) will contain a 3,500-room luxury hotel, 300 private residences, restaurants, retail, convention space and a casino. 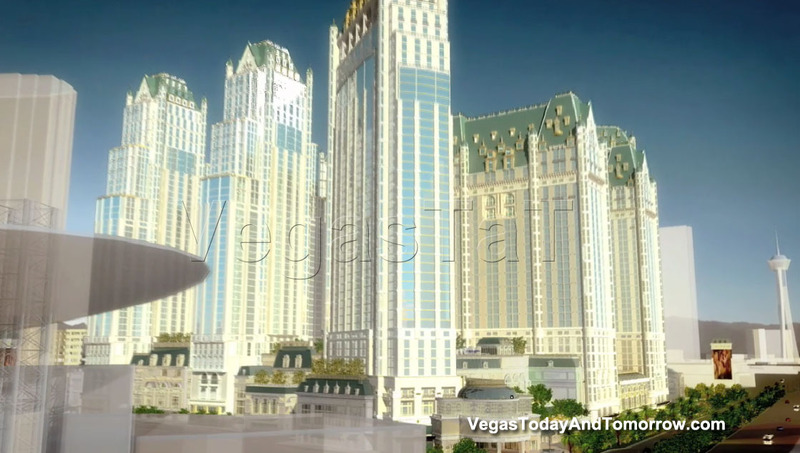 They are promising a level of luxury that will surpass anything in Vegas (sounds like Mobile and AAA will have to add another star and diamond to their matrix to keep up). 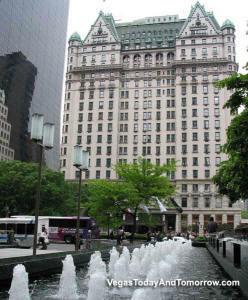 The main resort, is said to be a replica of the New York landmark. The New York Plaza is a 19-story building (right) which holds 800 rooms and the new hotel will have 3,500 rooms, looks like a design challenge to me. The New Frontier will close in July 15, 2007 and be imploded in early 2008. 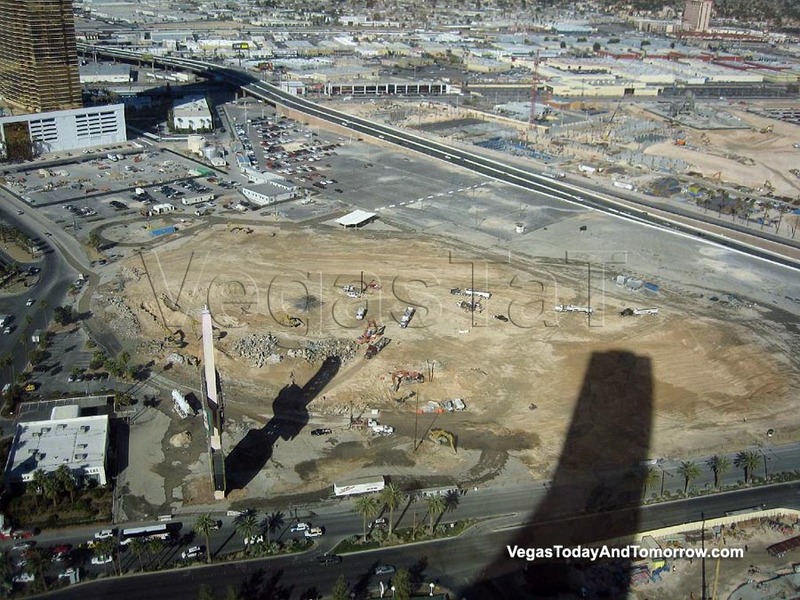 2011 is the expected opening date. No groundbreaking date has been announced. 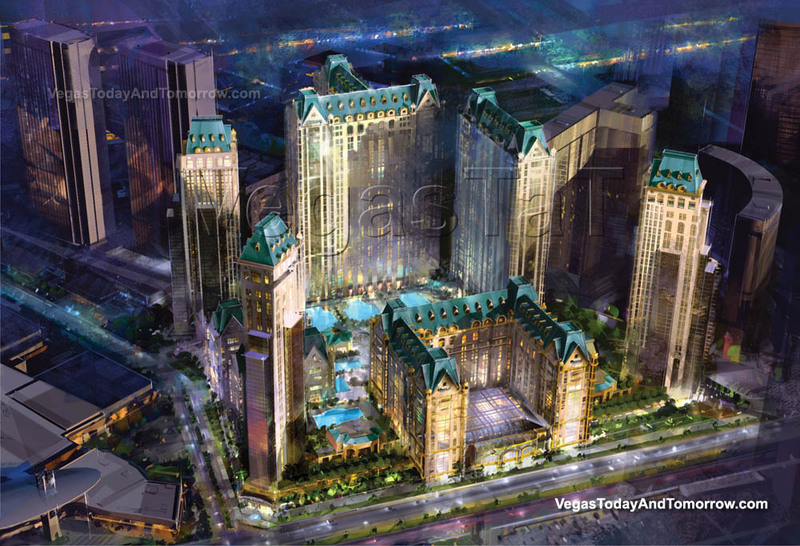 Tamares Las Vegas Properties, the owners of Plaza Las Vegas, the downtrodden, downtown hotel, has filed a complaint with the Clark County District Court, to block ELAD from using the Plaza name for its new six-star strip project. Who would confuse a 2-star downtown hotel (next to the bus station) with one of the finest hotels in the world? "Plaza Las Vegas" and "The Plaza" are not the same name, so I don't think their complaint will hold water. 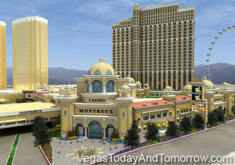 Plaza Las Vegas is probably going to be imploded anyway and replaced, due to plans to extend Fremont over the tracks to the proposed 61-acre redevelopment. I think ELAD should buy the downtown Plaza and be "front row center" for the new Fremont bridge to the 61 acres. They could then build a new hotel there and name it something different. That would stop this silliness. It seems the David Atwell (big-time strip real estate deal maker) has sued ELAD, claiming that he was first to initiate the $1.2 billion deal for the New Frontier land. Atwell's thirty-year-old company, Resort Properties of America, has been responsible for many big Las Vegas deals including; Caesars Palace, Steve Wynn and Hilton. 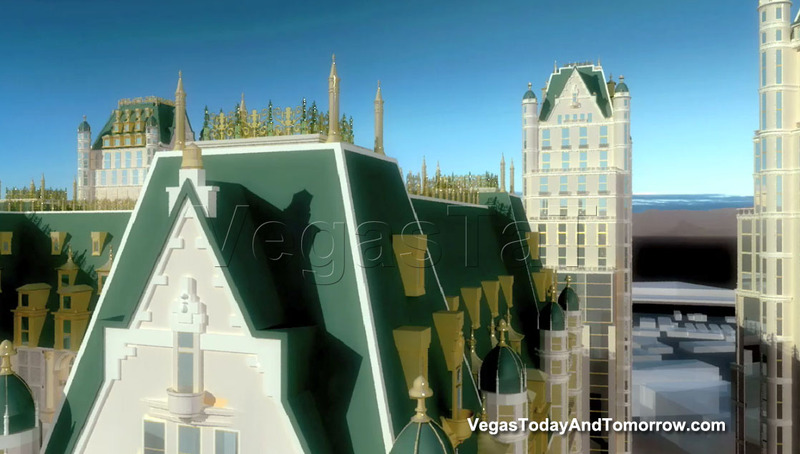 How and if this will affect the planned Plaza hotel is yet to be seen. Phil Ruffin's original plan for the property was Montreux.